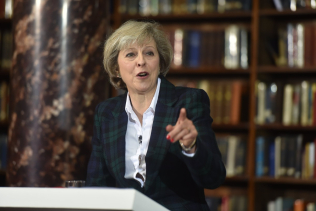 Theresa May continues to be the most favourable candidate in the race to be the new Conservative Leader according to a new poll by Survation on behalf of the Constitutional Research Council. In keeping with recent online polling by Survation on behalf of the Mail on Sunday, our latest telephone poll shows May as the only one of the five Conservative Leadership candidates with a significant positive favourability rating (+29) among the general public. Andrea Leadsom was the only other candidate with positive favourability (+0.5), although two-in-five people told us that they hadn’t heard of her. More significantly, among Conservative 2015 voters Mrs May’s favourability rose to +69, while Leadsom’s only rose to +10. 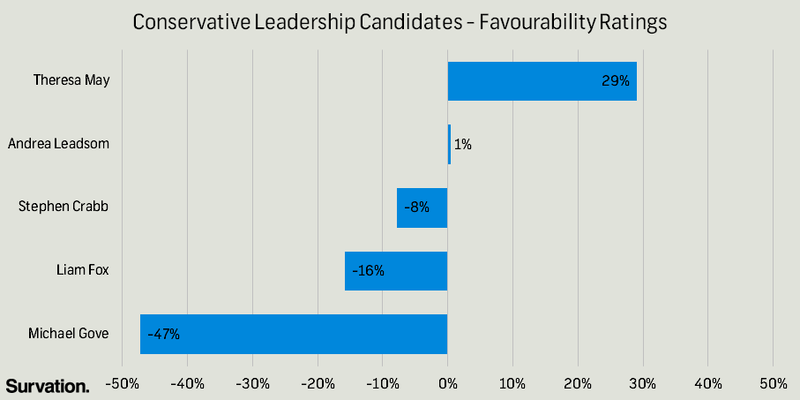 All of the male leadership candidates had negative favourability ratings, even among Conservative 2015 voters, where Michael Gove’s in particular was as low as -50. We also asked respondents whether they trusted the leadership candidates to preserve the future of the United Kingdom; again, it was Mrs May who came out ahead of all of her rivals, with 44% saying that they did trust her and just over a quarter (27%) saying they did not. The amount saying that they did trust her rose to over two-thirds (69%) of 2015 Conservative voters and, once again, Andrea Leadsom was the ‘best of the rest’ among both the overall UK-sample and Conservative voters. Finally, respondents were asked whether each of the candidates being the leader of the Conservative Party would make them more or less likely to vote Conservative at the next General Election. Whilst about half of the public told us that, for each candidate, being leader of the Conservative Party would not affect their vote, more than a quarter (28%) said that Theresa May would make them more likely to vote Conservative, compared to 10% who said her leadership would make them less likely to vote Conservative. 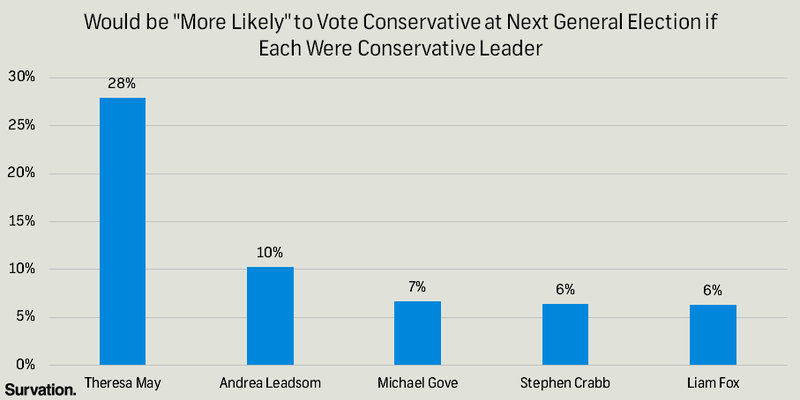 No other candidate had a higher percentage saying that their leadership would make them more likely to vote Conservative than the opposite – while two-in-five (41%) of Conservative 2015 voters actually said that Michael Gove being Conservative leader would make them less likely to vote Conservative at the next election. Survation interviewed 1,008 UK adults aged 18+ between 4th – 5th July 2016, before Liam Fox was eliminated and Stephen Crabb dropped out of the race on Tuesday evening. Full data tables are available here. Amongst all sections of the Public, Theresa May Currently Clear Choice for Next Leader of the Conservative Party.